eureka software can create searchable archive DVDs that include all the license application support documents. The documents then become easily accessible to those working on negotiations for the license. And, as the licensing process moves forward into implementation and through settlement negotiations, having license application documentation content accessible by a search of interactive PDFs and the simple click of a mouse is a win-win situation for both the client and FERC. 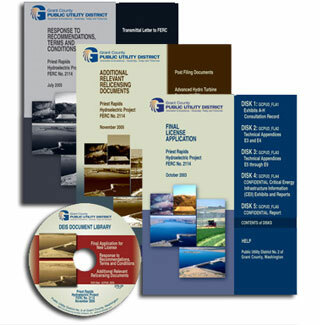 See our portfolio CD/DVD page to view our client solutions. An enormous amount of information is generated before, during, and after a licensing process. Organization of and access to that information is critical to fulfilling licensing goals. A good licensing management solution can provide structure and access to crucial business materials across a variety of platforms. eureka software has the essential experience to design, integrate, and implement licensing management solutions using tools such as SharePoint Portal Server, team services collaboration software, and current project management technology. Each licensing, relicensing, or compliance project can have its own diverse challenges and needs. At the onset of a project, the data, information, and knowledge generated is fundamental for the short-term survival of the management of licensing or relicensing a facility. Long-term knowledge management is essential for compliance and continued maintenance, perhaps encompassing the next fifty years. The development of a customized knowledge management system expedites the success of the process by organizing the knowledge about the project into a knowledge base that has a twofold function: To obtain the license and then manage the resource over the long haul. There is a natural correlation between a cost-effective document and project management system and a user-friendly knowledge management system. Let eureka software help you establish a knowledge management system that will serve the short- and long-term of your licensing or relicensing process. Complex document management is as simple as opening a browser! Using Windows SharePoint Services technology, eureka software can help configure a strategy that is custom-designed to solve your specific content management needs. Advanced searching, indexing, document management, and collaboration options mean that your knowledge management system works efficiently and effectively, whether dealing with hundreds or millions of pieces of information. Using digital dashboard technology, we can develop a functional and easy-to-use browser interface with custom web parts designed specifically for your organization. See our portfolio Websites page to view our client solutions. SharePoint training can be tailored to your organization's specific needs. Instructor-led training sessions include visual and hands-on interactive presentations, customized training manuals, and the full support of our expert staff.